All at 19:30 in Melksham Town Hall. All welcome. Further details meeting by meeting on this thread and I will add links to the MRUG webiste too. Melksham Rail User Group meeting this evening (24th Feb 2017) at Melksham Town Hall. 19:30 start, all welcome. Nothing on that website for those dates? There's also a glaring error on the fares/timetable page...anyone else spot it? 2nd March / tomorrow, with regret, is invite only but those who attended the meeting last Friday are aware of it and a news release will follow. You will see the logic later. 1st and 26th April, publicity there / here shortly. Not very helpful to the person who maintains the page (not me, but a member here) to be told there's a glaring error without saying what it is. Please p.m. me or contact the secretary of the group - easier to deal with and put right if we know about it! You can't buy a season for a period between 7 days & 1 month. Not a serious error that needed correcting there & then, otherwise I would have memtioned it last night. Melksham Rail User Group - 19:30, Friday 12th May 2017, Melksham Town Hall. - Service and capacity issues. More trains, longer trains, later trains? - AGM / new committee - newcomers welcome. For what its worth, I've checked the wording on the website. It states 'Season tickets offering unlimited journeys between specified points (and intermediate stations) are available for periods ranging from 7 days to 1 year.' It does not state or imply any number of days from 8 to 356. However I agree it couold be misleading, so I'll modify. Thanks for pointing it out. You can only buy weeklies (one at a time), or monthlies. Monthlies can be extended by adding weekly and or daily tickets to a monthly, thus allowing any period between a monthly an annual. Not sure why you can't buy two weeklies (to total a fortnight) in one go. And of course, adding daily tickets provides no further discount over what a weekly does. Last night's meeting ... moved next meeting from 1st December to 29th November / as a user group rather than a development group, trying a mid week evening as there were an awful lot of apologies for the Friday night. Santa wrapping on 15th December, Santa on the train on 17th December at 14:50 to Swindon (subject to engineering check and Santa check). 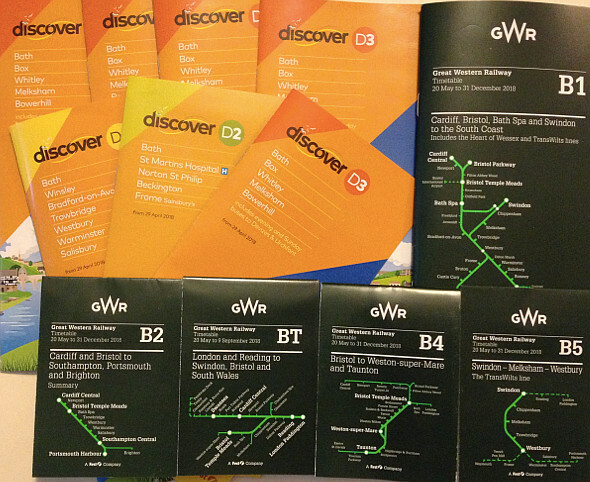 So the new timetables are available in print form but not on the GWR website, bizarre and quite frankly poor. You will note "a few" ... I will have a lot more printed copies available a few days ahead. Wide distribution before a timetable starts tends to mean that people turn up for services not yet running, or late for a train that's moved later in the new timetable and see the taillights of it leaving at the old time. So I'm afraid that the whole thing is engineered to serve the many as is considered best, with frustrated few (who can read a start date) being - err - frustrated. Not so bothered about the printed versions as I agree they shouldn’t be widely distributed unless specifically requested at your local station. Other TOCs have their new timetables up on their websites so why can’t GWR? The printed version would have gone to print at least two weeks ago so there is no excuse not to have them on their site at least four weeks out.